A study that 23andMe collaborated on with researchers at Pfizer Inc last year, showed that genetics plays a role in both the amount of swelling from a bite and how often a person gets bit. That study found 15 genetic variants — almost all on or near genes associated with the immune response — associated with both the intensity of the reaction to the bite and the frequency of bites. 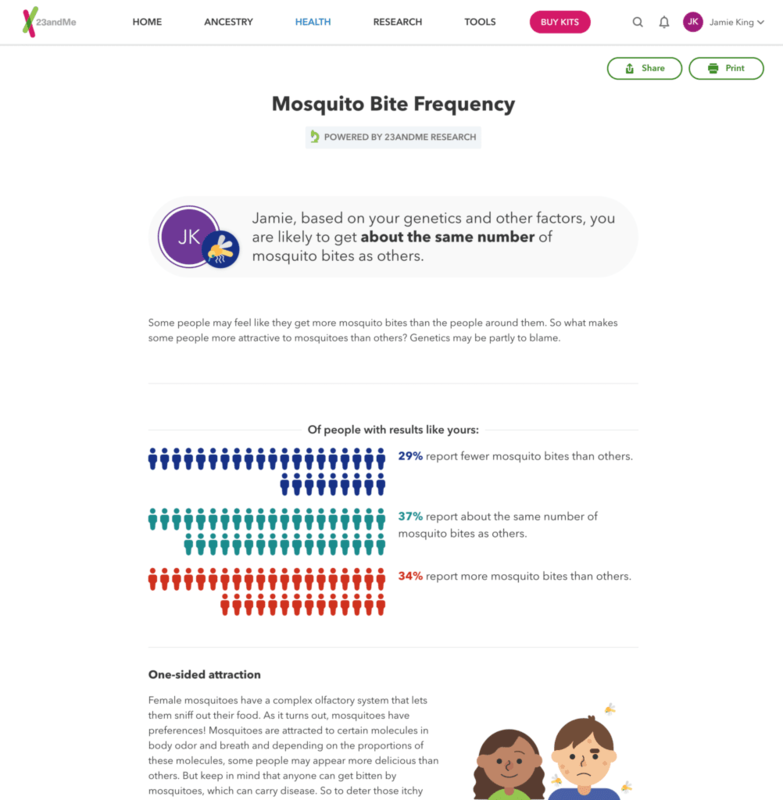 23andMe’s new Mosquito Bite Frequency trait report goes far beyond those initial findings and uses more than 280 genetic variants associated with mosquito attractiveness to calculate its estimate. It turns out that female mosquitoes — it’s only the female mosquito that drinks our blood — have a good nose for prey. Their complex olfactory system leads them to prefer some people’s scent to others. Indeed, data from 23andMe customers who consented to participate in research indicate that more than a third, 37.5 percent, report being bitten more often than others. A little more than a quarter, 27.5 percent, said they were bitten less frequently. Beyond getting a few bug bites another right of summer is getting a little sun, and for some that can also mean a slight change in the color of their hair. But getting a beach blonde hairdo is a bit more complicated than you’d imagine with dozens of genetic variants influencing whether the sun will lighten your hair. 23andMe scientists identified 48 different genetic variants that affect this trait among people of European ancestry. The genetics around hair photobleaching should not be confused with the hundreds of genes associated with hair color. 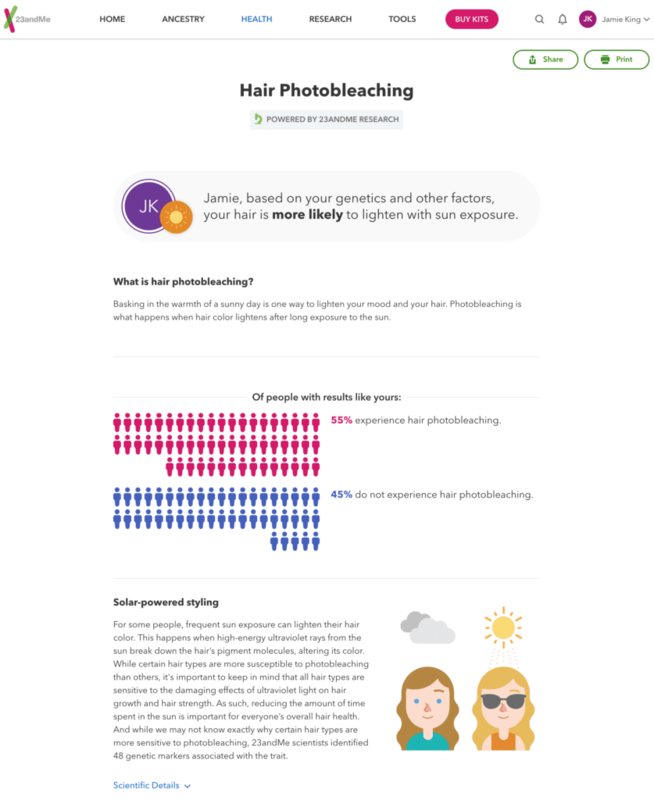 According to data that 23andMe used to create this trait report, a little more than 72 percent of customers who consented to participate in research and have European ancestry reported that the sun lightens their hair. It turns out that certain fears, including acrophobia, which is the fear of heights, have a genetic component. 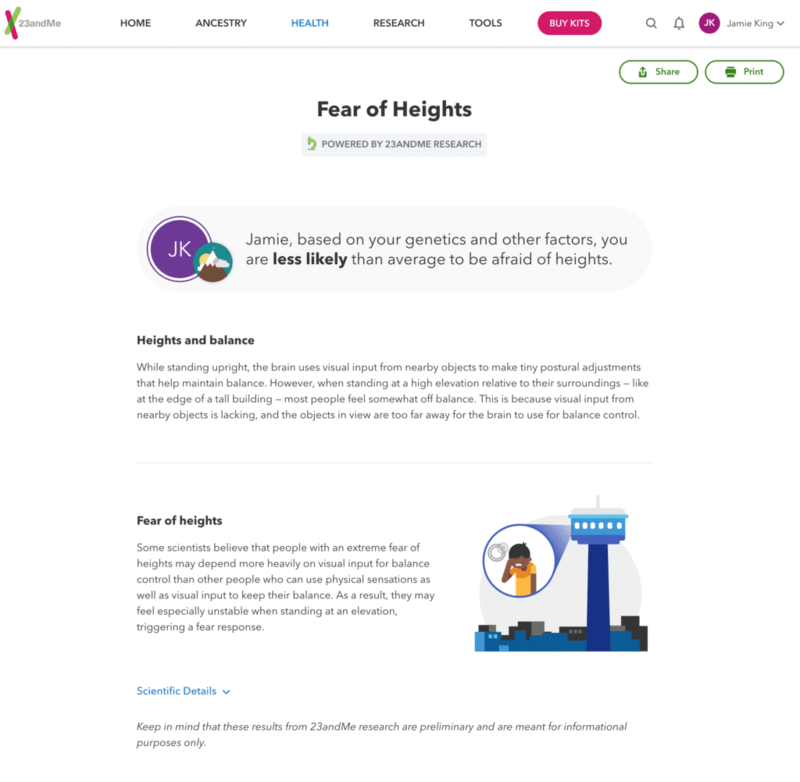 23andMe reports on whether your genetics makes you more or less likely than the average person to be afraid of heights. While a phobia can be learned, there are also fears that are influenced by genetics. Fear of heights is relatively common, affecting as many as one in three people, according to one study. This is consistent with what scientists at 23andMe found among customers who consented to participate in research, with about 37 percent saying they were afraid of heights. The feelings one has may be based on the visual stimulus one experiences when standing near the edge of a significant drop-off, where the nearby objects one uses as optical input to maintain balance is absent. Scientists believe that acrophobia might be stronger in those who depend heavily on visual information for balance, which also has a genetic component. More than just being able to sing, the ability to match a musical note is something that some people are just born with. 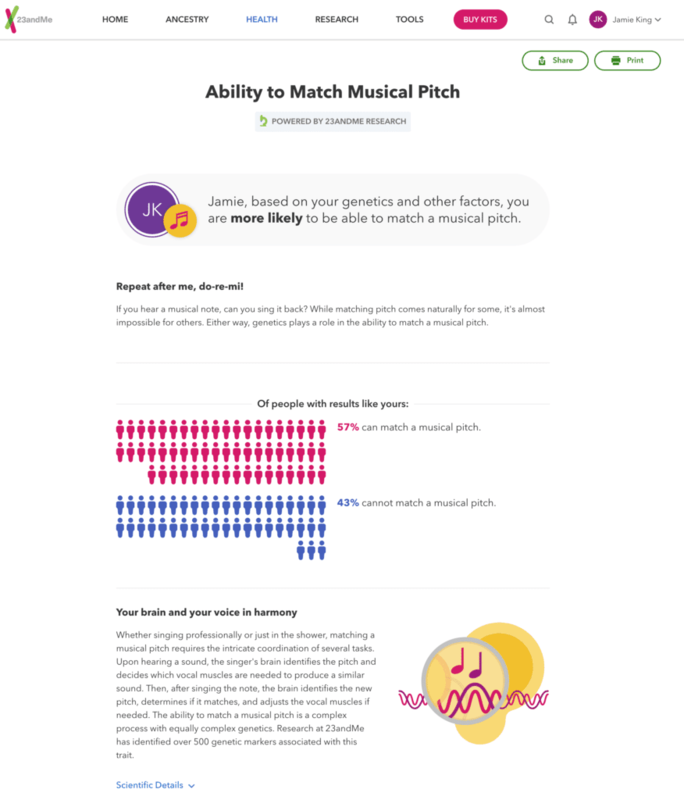 23andMe now reports on whether your genetics makes it more or less likely that you’ll match a musical pitch. Although it might seem simple for those with this instinctive ability, there is actually a lot going on. Reproducing a note requires the ability first to hear the pitch, and then the brain identifies the muscles needed to produce the sound. About half of 23andMe customers who consented to participate in research say they can sing back any note, and our researchers have identified no fewer than 500 genetic variants associated with the ability to match musical pitch. Together, these trait reports show that traits like these — as well as the more than two-dozen others that we offer to health + ancestry customers — are influenced by your genetics. The reports can help give you a bit more insight into the fascinating world of genetics, and how the interplay between your DNA and your environment can ultimately influence who you are.